She invokes the spirit of her ancestor, but is visited by her ancestress. He heads straight for the Prince but is intercepted by the Minister. It is best. This can especially true in those situations where one is considering, say, issues related to spatialization and sound source placement. However, there are other interesting options out there - a good number of which take the form not of a document consulted after throwing coins or yarrow stalks, but the tried and true "Take a card." Let's start with my personal favorite and longtime go-to: The Oblique Strategies. They're a deck of over a hundred cards first invented in the 1970s by Brian Eno and his friend and teacher Peter Schmidt. The resulting collection of aphorisms turned into the deck of cards we know about today, now having gone through a number of revisions along the way, and appeared in numerous printed editions, apps, Max patches, and other forms. I’ve owned a deck since the first edition appeared, and collect them. In practice, the contents of the deck are aimed generally toward little sideways diversions – some of which make use of the language of the visual arts (as you’d expect, since Peter Schmidt was a visual artist) or the practice of making or recording music. What’s continued to interest me is that they’re still useful, even after all this time. When you’ve had them around for a while, the aphorisms often tend to become memorable items you can call to mind even without drawing a card (What would your best friend do?). Other times, there’ll be the card you have completely forgotten until now (Not building a wall, but making a brick). 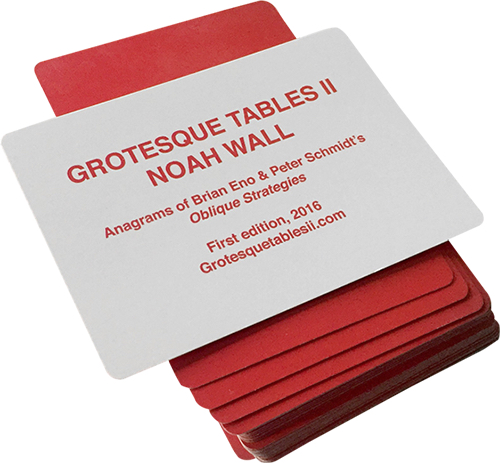 You can acquire a physical copy of The Oblique Strategies for yourself here. Alternately, you can find iOS application versions, Android versions, and numerous online Oblique Strategy decks to consult. One of them concerns itself with giving a very specific kind of advice, enlivens its costume with some dice, and is a great – if somewhat less oracular – way to compose music. One interesting addition to the guides/games-for-musicians genre comes from Scott Hughes - it's called “Tonic: The Card & Dice Game for Musicians." It borders on Dungeons & Dragons territory as a way of getting you composing (or recomposing, if you're stuck). Combining a set of 63 cards with three 12-sided die, you can attack ideas of compositional and improvisational gaming with gusto. The cards in this deck are a little more explicitly musical than the Oblique Strategies. With cards bearing instructions like “Play this graph” or “Use just one interval”, you are told what to try in very clear musical terms. 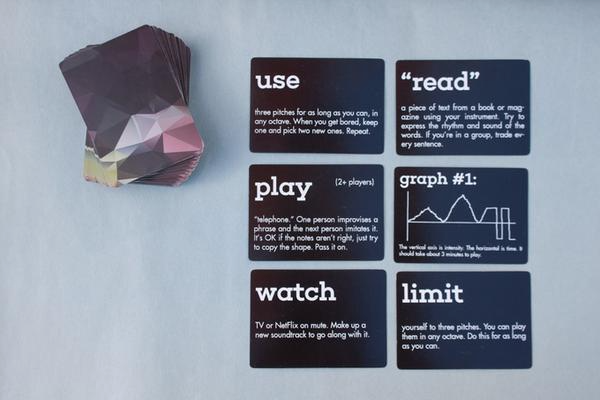 Each has some wiggle room, however - for example, the “one interval” card adds the sentence “You are free to move it around as much as you wish.” In addition, you add the variations provided by the dice (which have note names on them, rather than numbers), providing for a tremendous set of variations from the options at hand. Are you curious, but maybe not ready to plunk down the cash? The cards’ text is available in a PDF, provided by the author for you to try on your own; this is available, along with a commercial set of cards and dice, from the author’s website. The oracular approach is usually about solving a given problem, or trying to break a logjam. And the world is full of people who have thought long and hard (and well, occasionally) on a more generalized approach to problem solving – often, in situations where groups are involved. One well-known version of this approach is The Creative Whack Pack, which takes its name from the Zen blow upside the head that leads to Enlightenment. 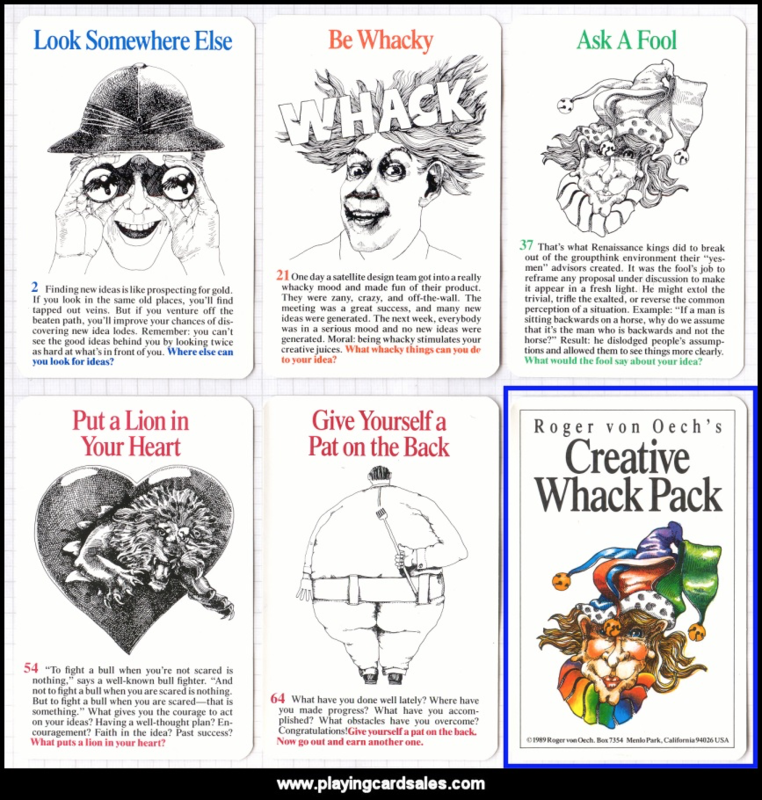 Roger von Oech's interest in creative problem solving started with a book, whose summarized contents morphed into the pack of cards (and an iOS app in the bargain, too). They're focused - in a more general sense - on more generalized strategies for problem solving. They're also considerably more verbose in the sense that you're getting not only the instruction, but some background information that expands and grounds the original suggestion - it's quite a different approach to a similar problem, when compared to the Oblique Strategies. But it may be just what you need. All of these would be great resources for you, or – since we have a holiday season approaching – a great gift for a chronically creatively constipated companion. But what about the perfect gift for The Person Who Has Everything Including The Oblique Strategies? Never fear – here’s an unusually helpful deck of cards they probably won’t see coming - the Grotesque Tables II.